Anyone who knows me is aware that I am queer for j-frames and always have been. When I saw the new production Model 40 at SHOT I knew I would have to get one. Production was delayed several times but writer's samples just went out ant I picked this up today. Forgive the less than stellar photos. By the time I got home, I was almost out of daylight. Smith has done it right! The new Centennial is offered in real nickel, polished blue, and with a case hardened frame. As you can see, the one I received is nickeled. The polish job is "almost" as good as in the old days. Because the Model 40 has a grip safety, Smith did not put the key lock in the frame. Good move. The pics don't do the stocks justice. The grain and color are exceptional. It was also good to see the "marcus registradas" back on the right side of the frame and the S&W crest on teh left side below the cylinder release, where it belongs. The cylinder release is also the old style. Now all I need is a polished Tyler T grip! Guys, this one is a keeper even if I have to hock something to pay for it. I'll be getting an article done on it for Harris so stay tuned for more. Here's to all of us j-frame junkies. Last edited by Rob Garrett on Sat Oct 13, 2007 5:20 pm, edited 2 times in total. ohhh...cool little gun rob, you sure do get all the cool stuff to write about. I haven't made it to the range but it is rated for +P loads as is evident by the reinforce area on the left side of the frame and the markings on the barrel. I'll get range report posted in the next week or so. By the way, the pin holes to disable the grip safety have been deleted in the new model. I can live with that since the key lock is gone! Id like to find one before they started to fill the holes. What price range are we looking at for one of the older ones? VERY NEAT!!!!! I do love the classics, too bad Colt can't get their heads outta their rectums and start making some classics again! 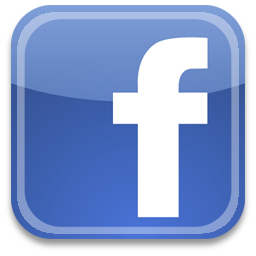 At least S&W has regained the publics trust and giving the customers a lot of what they want now days. I may have to look into one of these babies soon! Very cool!! I look forward to reading the article Mr. Garrett. Dang Rob!! You get all the cool stuff!! 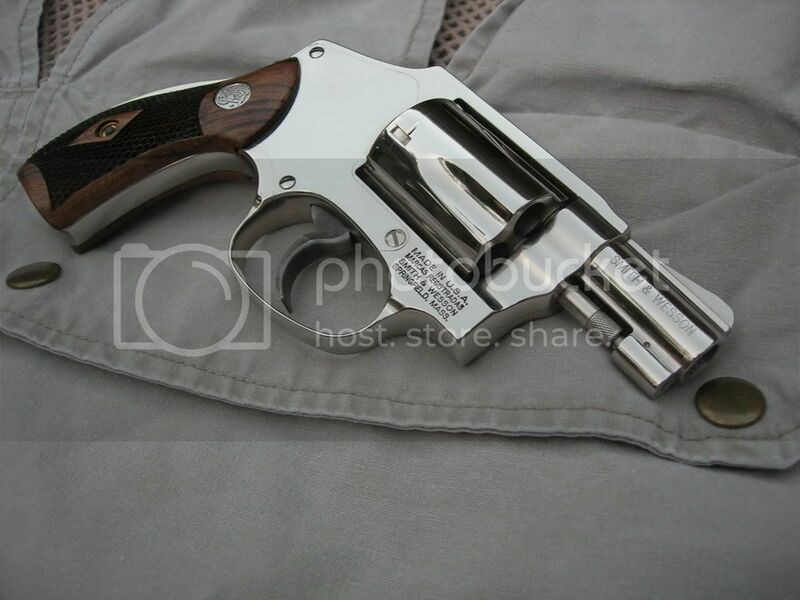 Fellas, I got to see a few of these at SHOT when Rob grabbed me hauled me off to the S&W booth... and Iâ€™m glad he did. In this day of scandium this and tritainum that the M40 has always been on of those guns that makes sense and is cool too. I like aluminum J-frames just as much as the next guy but there is something nice about a small wheelgun that you can carry easily and shoot allot. I think one of these is going to look good in my Alessi ankle rig. I can't wait to order both a blue and a color-case hardened one ! I have owned several old ones (and currently have a 1955 production model). The Centennial is my favorite revolvers. I posted this on S&W Forum. One of the guys over there said that dealer on the nickeled M-40 would be about $550.00. I am having to wait to shoot it until my professional photographer shoots the lead photo for the article. Jason, I told you so! Here are a few new pics to include a pocket rig from Sparks and some "antique" ammo. That Winchester Treasury load is some really hot stuff that pushed a 110 gr. JHP out of a 2" j-frame at over 1000fps. Be sure to check out Matt Del Fatti's custom rig for the Centennial on the holster post. 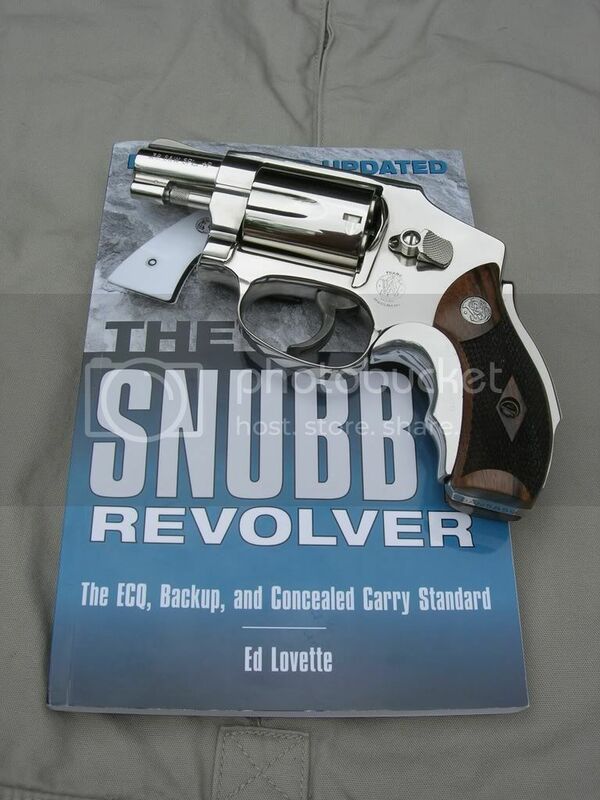 Also, if you carry a snubby, you should have a copy of Ed Lovette's book in your library. I have some stag stocks coming for the Centennial so stay tuned for more eye candy! Do you think that Smith and Wesson may be testing the waters to see just how much action they get on a non lock model? Given the overall quality of their product and the prices the prelocks are beginning to command, including non lock models could have a tremendous impact on all those who have sworn off smith products due to the lock. I really don't want to get into a discussion on the lock/non-lock issue. They went crazy over the issue on the S&W forum. But, to answer the question, I visited Springfield last year and the lock is here to stay. The Model 40 is an exception only because of the grip safety. Does it make sense? No. We got the Centennial dirty today with about 100 rounds. This was from an honest 7 yards and was the first shots after only putting about 15 rounds through the gun. The groups got better but I didn't have another clean target. Last edited by Rob Garrett on Sun Oct 14, 2007 10:51 am, edited 1 time in total. I just read the article in a magazine and recognized the pictures. 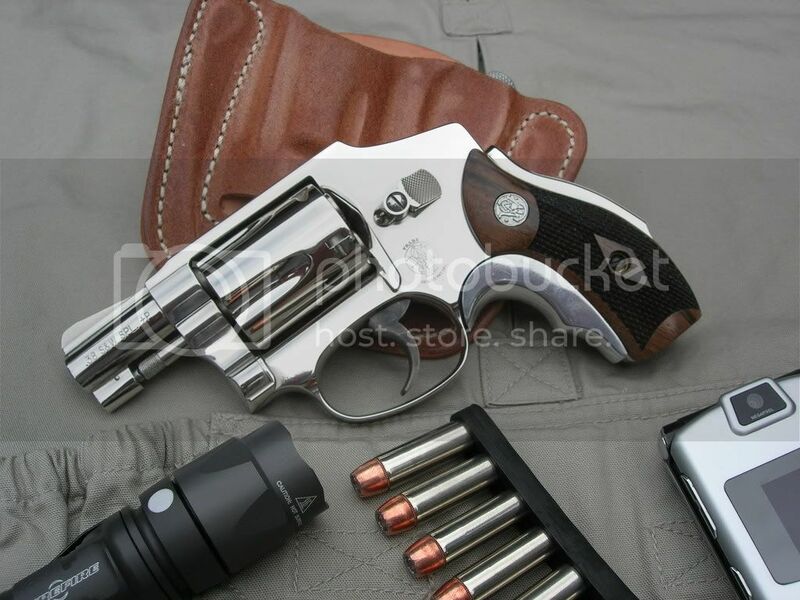 I really love the old steel j frames and t-grips even though I grew up on the tail end of the revolver era. The grip safety, which I see as a novelty for the most part, gives this revolver what all S&Ws need most. NO KEY LOCK. I will buy a few as mine have a lot of wear from carry. This will save a few collectors guns from being used for carry and getting the nicks an dings that eventually show up. 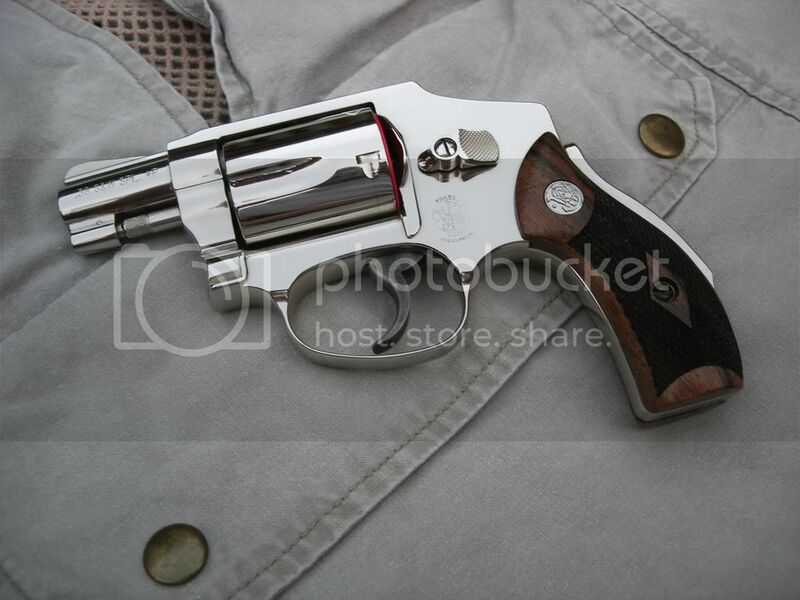 Since you have enough clout to get them to send you a gun, have them make an L-frame bodyguard airweight in .44 special with out a Ti cylinder. It would make a nice primary belt gun. ala the 296 with a steel cylinder. Great article. I like seeing real target grouping photos. I just picked up my new M40 (blued) from my dealer last night. Very neat. I did notice that the grip frame half-moon cutout is a smaller diameter than standard production J-frames - just like the 1950s version. I have a pre-M40 Centennial (before S&W started to use numbers for their guns) in pretty nice shape. I'll try to take some pictures of the two together this weekend. Nice little 40 you have there! Thanks. This one is a keeper. 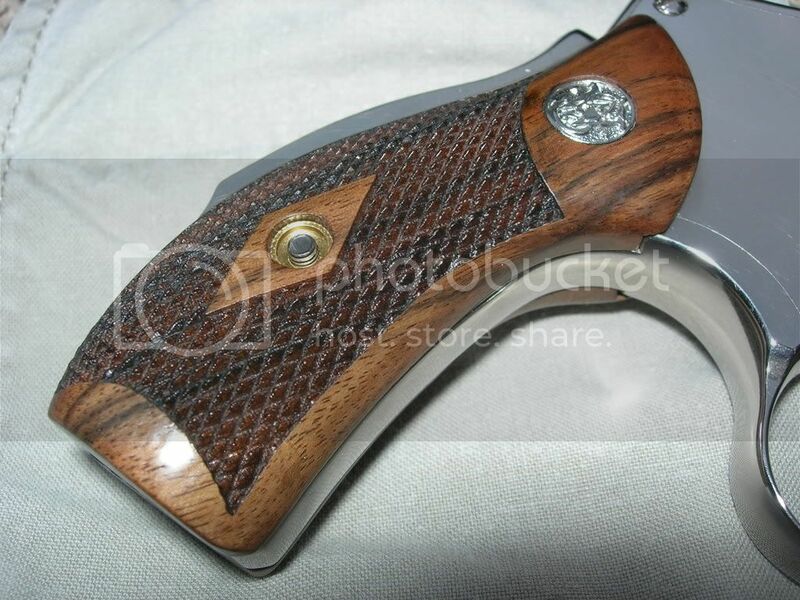 I've also thought about getting a blued model and putting a 3" barrel on it. That would be a one-of-a-kind Centennial. I recently taught a ladies firearms course and the most popular pistol they wanted to shoot, and buy, was a Smith 642 with the LG-405 CTC lasergrips. You really can't beat a J-frame! Did you find the grip safety to be a hindrance? Is it like a 1911-not noticeable? The grip safety is not bothersome at all. I purchased one of these "New" Model 40 S&W revolvers after foolishly selling two original Model 40s that I thought I would not miss. I know....... I must have gotten hit with the "stupid tree", but so be it. I have somewhat rectified that judgmental error by purchasing one of "new ones". My problem is that the new one has a horribly heavy trigger pull....... much heavier than my originals. 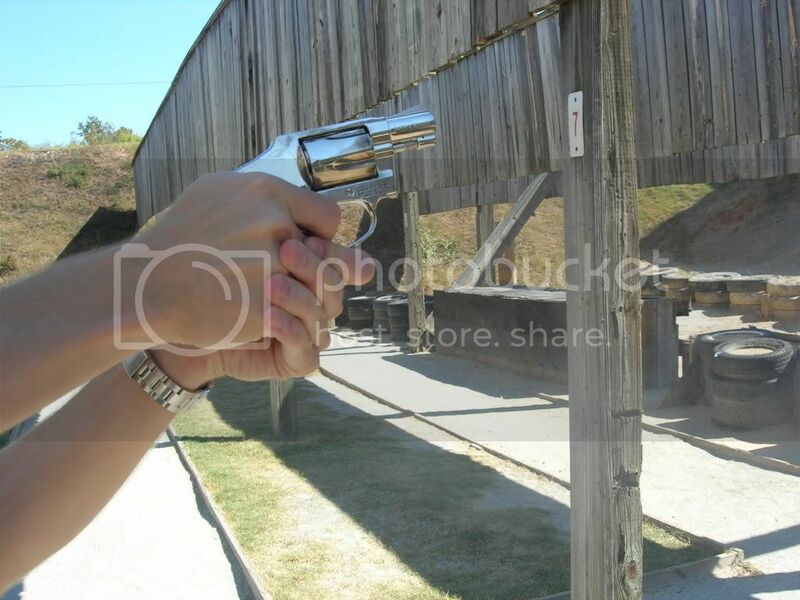 How was the trigger pull on the ones you handled? 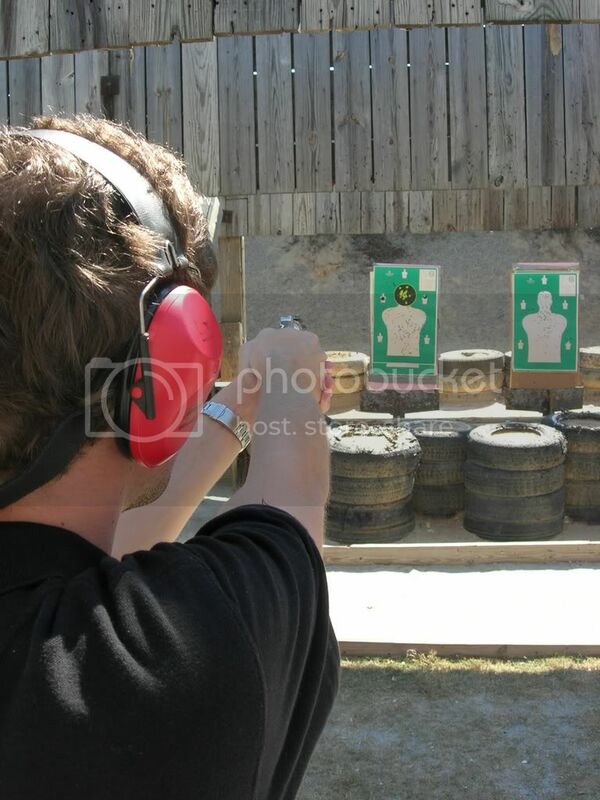 Did the trigger pull lighten up with the round count? In your opinion can the trigger be lightened without sacrificing reliable ignition?? Thank you for any assistance you can offer. I really do like the piece but the trigger pull is a killer. Not Mr. Garrett, but I too have one of the new ones, and in my former life, was a S&W certified armorer. My experience is that the spring kit (hammer and trigger return) from ISMI offers the best balance of reliability and smoothness, along with lightening, of J-frames. I am running them in all of mine - a 1955 pre-M40 Centennial, a new M40, two 642s, a 640, two 640-1s, and a 638. So I guess you could say I'm a believer... Marc over at ISMI has forgotten more about springs than most people know about them. I concur with OldLawman. I have spring kits in several of my j-frames and will eventually put one in the Model 40-1. I found that dry firing while watching tv smoothed up some of the roughness. 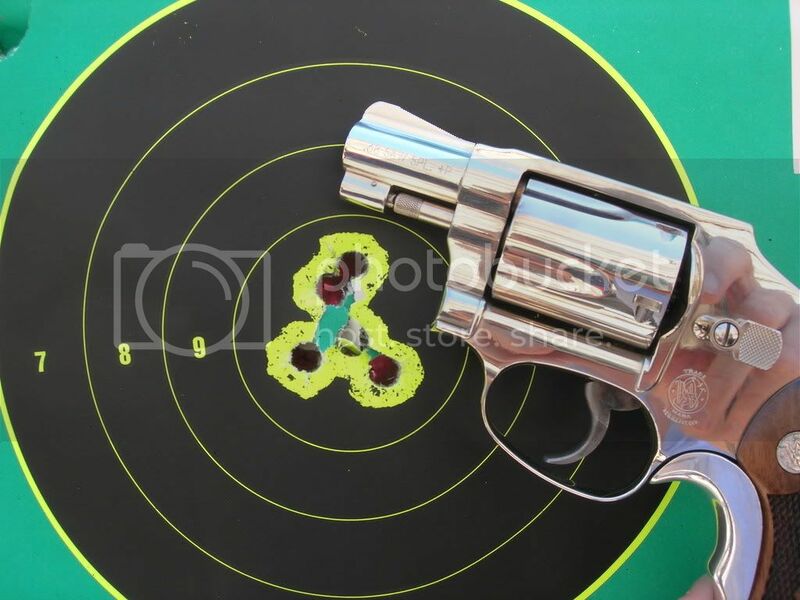 This is not a Performance Center revolver. Before all is said and done, I will have one of my favorite smiths work the internals to make it like the old ones. Jefro, if you ever get crazy and want to sell some old j-frames, give me a call. However, I would imagine that you have mourned enough over the pair of original Centennials that you won't be doing that any time soon! Thank you for the replies and advice. And Old lawman, you are absolutely correct about Marc at ISMI. He is not only quite knowledgable but very willing to educate others. He is a real gentleman. I order springs and spring kits from him periodically and even though I might only order a few springs, he treats everyone like they are his main customer......great old-fashioned friendly service. And Rob, sorry, but as you noted, I learned my lesson selling J-frames ....... I could kick myself for selling the few I did sell, but no more!! Concealed hammer J-Frames are perfect pocket pistols, IMO. 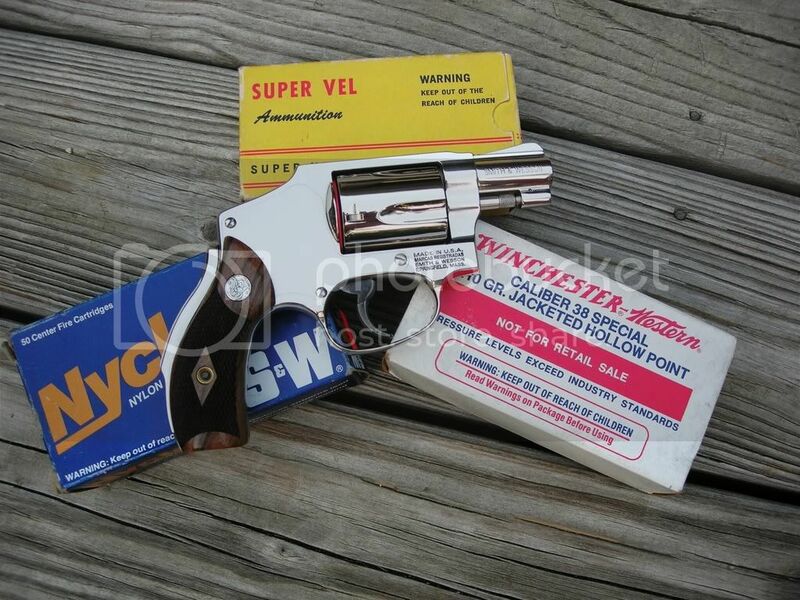 I routinely stick an old 642 in my pocket when I just want a small, hideout gun. Slick looking little gun. Not a big fan of the concealed hammer though, but I understand its purpose. I'm a huge fan of the J-frame but I have a confession to make. Several years back I sent my best little j-frame in to Mag-na-port and had them port it. The gun has never been the same, it shoots real low and it does not feel the same. Can the ports be filled or do I need to sell this little gun and start over??? You may want to send it to S&W and have them re-barrel it.